Whether you’re a school administrator or transportation director, you should be concerned about your school’s bus routing system. While choosing the right bus route can save your students time and ensure safe transportation, failure to consider better transportation routes can cause delays and may even be dangerous. What affects a school bus route and where should your bus route be placed for maximum safety? There is no perfect bus route because it is impossible to eliminate every possible hazard on the road. As a transportation director, you can weigh the risks of potential routes and choose the one that presents the least danger to both your fleet and students. First and foremost, bus routes should be safe. However, they should also be efficient — after all, you want your students to arrive at school and home on time. Finding a balance between safety and efficiency is essential when searching for the best routes for your fleet. It is important to recognize that many schools have policies specifying the maximum distance permitted between a student’s home and their school bus stop. This practice may vary with the age of passengers, and maximum distance requirements can make ideal bus routes harder to find. In these cases, computer software can be used to help determine the ideal route in a limited geographical area. In a perfect world, you could simply select the safest bus routes for your school and be done. In reality, numerous factors can change over time and may increase or decrease the safety of a route. As the transportation director of your school, you should be aware of such changes and be ready to update your fleet’s routes when necessary. How long will the construction take place? Will the construction increase traffic volume along the route? Are there safer alternative routes? Whenever possible, avoid routes that have construction going on — building projects increase route danger for many reasons, including falling debris, rubbernecking drivers, unfamiliar detours, and low road visibility due to dust and equipment. Speed change: In an effort to alleviate traffic, civic leaders may determine that a speed limit change is needed on roads along your bus routes. If there is a substantial speed increase (10 mph for example), you may want to search for safer routes. Try to keep your fleet off high speed limit roads when you can. Weather hazard: You may have a bus route that’s perfectly safe eight months of the year, but a nightmare in the wintertime. Bus routes close to rivers, streams, and bridges should be closely monitored in the colder months to ensure ice hazards do not exist. Addition of traffic signs: In some cases, current routes may remain the same while safer routes suddenly appear. Safer routes may become viable as a result of traffic construction or the implementation of new traffic lights or signs — think new stop signs, yield signs, or pedestrian crosswalks. One of the best ways to identify safe routes for your school is to use routing-specific software. 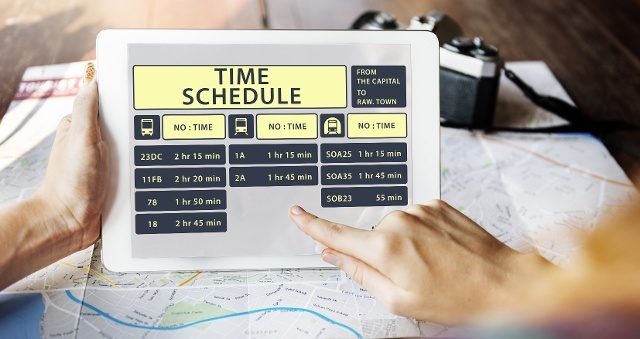 Computer algorithms can quickly run through bus routes, identify hazards, and help you devise an efficient routing plan for your fleet.